Think back to the Gun laws. Remember how some citizens were against taking guns away from the “people”? The reason being, that the “bad guys” will always have access to them and the “good guys” who are in need of protection; get killed in the meantime because their safety net, their weapons to fight against being robbed were taken away from them! Well, my friends, the same thing is happening now, this 2016; to “real pain patients” fighting against being “robbed” of their “safety net, their weapons” to fight against the chronic intractable pain, and nerve pain that “WE” live with day in and day out. Yes, I am one of those people suffering and trying to be a “pain warrior”. While I am fighting yet another battle to live maybe not “pain free”; but possibly with less pain and more living! We are fighting a war against being robbed of the very weapons we need to fight. I have complex regional pain syndrome (CRPS) and I’m fighting to live not “pain free,” but with less pain and more living. Those in positions to help, need to take the time to do so. All 50 states now have proclamations that explain the burning, fire-like pain of CRPS. They discuss allodynia, or extreme sensitivity to touch, and the pain it brings. But all of this means nothing if the government, FDA,CDC, physicians, and pharmacies take away the means of lessening our pain. We follow the rules, sign contracts with our pain doctors, and jump through hoops to get what we need to try and live some kind of life. On the other side of the spectrum are those who don’t follow rules and who break laws. But they have a different disease called addiction and they ruin it for all of us. Only about 5% of opioid prescribed patients are addicted, yet they are making us all feel like criminals. But this year in 2016, it is going to continue to get worse unless we rally around and try to do something about this travesty! This year the new prescribing guidelines are getting more horrible. The Physicians who were once very good and capable at what they did and cared about people living with real and horrible chronic pain day in and day out; these same Dr’s are cowering and refusing to give medicine for pain where it is truly needed. Yet…once again…as I’ve said above; those who want it, and who are true “addicts” will be able to find a way to get what they need! While law abiding citizens, suffering daily, have no other means than trying to advocate for ourselves and continue to try and do what we can do…. in a calm, legal and respectful manner. We are not “addicts”! We are people who are suffering with a horrific daily pain and who are “dependent” upon a pill, a patch, a spray or a lozenges; to get through our daily routines. Some of those “routines” involve mostly sitting in a “Lazy Boy chair” for many hours per day, trying to be as free from pain as possible because moving too much means more pain later! It is so sad when taking a shower is so painful, that it is very draining and the rest of the day is pretty much left to doing not much of anything else after taking care of basic needs. It is despicable that some pain doctors are being forced to push invasive surgeries on more patients. Physicians who pledged to “do no harm” will do surgery, instead of prescribing the medicine so desperately needed for the real chronic pain population. There are new controversial prescribing guidelines coming and some already in effect. These are leading to more and more restrictions put upon our primary care physicians and even tying the hands of our pain management doctors. The CDC, FDA, and other groups think that they know more about pain and pain management, but when have they ever studied such things? They are making a fake war on prescription drugs, when it’s really some kind of smokescreen for saving money! Well, I say “Pick on the real criminals”, not the “weak or the ill chronic pain sufferers”! I feel afraid and “bullied”, even though I’ve not experienced most of this yet. I pray that I never do. I have experienced enough issues with my Dr. of 12 years leaving me and his entire practice after having written several too many pain prescriptions and padding his own pockets! But what he did was still not my fault! I did nothing wrong! I am a lay person who did what my Dr. told me to do to alleviate my CRPS pain, Chiari I pain and the pain of multiple herniated/bulging discs, RA and OA etc. I never wanted to take any of these meds. I never smoked, drank or took any drugs; not ever! I was just naive enough to think that I could finally trust someone in this life and then the rug was pulled out from under me. (you can read about this in my prior blog posts). I had this happen to me this past year and when I tried to go and see the pain Dr. who originally saw me for several years following the car accident, he said that he “didn’t want any part of that other medical office’s mess”. I guess that was referring to me as a “mess” that he didn’t want to deal with! How rude and inconsiderate of him! I am a real person with feelings and so much pain, that some days I don’t know how I will make it through. 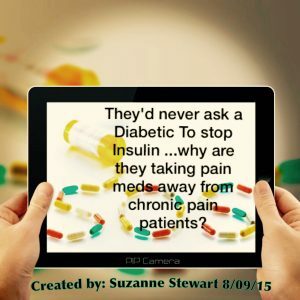 I’ve read that they are taking most pain medications away from anyone with non-malignant pain. Who are these non-medical personnel, these agencies, to say that malignant cancer pain is worse than non-malignant pain? Unless they’ve experienced either, how would they know? CRPS is #43 on the McGill pain index, right next to childbirth or amputation of a finger. The agencies are trying to also push exercise and healthy eating habits, along with PT and “behavioral therapy” as an alternative to “pills” to help pain. They are saying that the goal in all of this is to stop the overdoses and the prescription drug abuse. Well, I say to that and to them: “A person can only take the medication given to them by their Dr. and if the Dr. is a good one, he or she will only prescribe the amount needed. Then why take it away if the patient is doing everything right ? If I am doing what I am told and only taking what I am allowed to take, then why take it away from me when it gives me some kind of a little bit of so called “life”? There are only bad Dr’s and bad people who are hurting the rest of us. The innocents should not suffer because of the crimes of a few! The “addiction specialists” scream “HYPERALGESIA” to everyone on opioids for any length of time. They say the pain meds stop working and that we all get addicted! We are all individuals whose bodies may become physically dependent, but that’s very different from addiction. If it is working, then how can it be hyperalgesia? In all honesty, if the doctor is a good one, he or she will only prescribe the amount needed. Why take it away if the patient and doctor are doing everything right and when it gives some relief? The innocents should not suffer for the crimes of a few. Many patient advocate groups have written to the CDC and the FDA and explained that they are not being transparent. They used biased teams of people to make up these new “rules” and guidelines. They didn’t listen to the voices of the Dr’s and people who live in the “Pain world”. They also found that many of the people who put these new rules together have a monetary gain in such matters! The government and these agencies are practicing inhumane treatment towards real and true pain patients. They allowed insurance agencies and others who would gain from these guidelines to make decisions for us. One physician wrote in the Pain News Network that he has had patients on high doses of opioids for over 20 years and they have led quality lives. He also agrees that taking these meds from patients who’ve been on long term dosages is cruel and inhumane. Sometimes people who want to change things to save a few dollars or get their products pushed, such as spinal cord stimulators and pain pumps, are not thinking of patients like me, who do not fit inside a nice neat box. My issues are different. I need these pain meds to survive. So many lives have been lost because pain was not managed well! Chronic pain can kill you because it causes so many other issues and there’s a snowball effect when pain is not controlled. Please use your voice and be heard! Help yourselves, help your sisters, mothers, fathers and brothers. Please lets everyone who’s suffering with long term chronic horrible debilitating pain, take a stand and rally around one another. We need to form advocacy groups that will work together for the common good! Not “my group” and “your group” but we need an “our group” that will help us and speak up for us and with us and take a stand against all of the knuckleheads who just want to make a profit and don’t care if we live a fuller or lesser life. They don’t even care if we actually live or die because if we are no longer a “productive member of society” in the eyes of our government, CDC, FDA and the others, then we will not be heard nor will get the help that we deserve. Please write to your State representatives, and to our Federal agencies, House of representatives…anyone who will hear us and not just let it be words to the wind! Please let us stick together and not allow ourselves to be treated so hurtfully and inhumanely for no common good whatsoever. But only for the lies!